Hi we are Sushi Kanesaka (かねさか) Look forward to meeting you! The Sushi man (Ken san) speaks english, sushi is great, awesome sake. Will definitely come back. The sushi was just excellent. I think at this level it commes down to personal preferences. Service was great, and the chef gave you english names for the fish if possible. I didn't like the location inside the very fancy hotel. 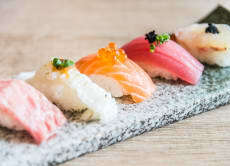 My only other reference for high end sushi is Taichi (寿し 太) which is hidden in some back ally. Sushi quality was at the same level, but it cost 80k instead of 120k for lunch. It is a great edo-mae sushi. Rice,sha-ri, is little bit wet and feels more veniger. But these thing is great harmony with fish, neta, and give more tasty and flavor. I never tasted like this in my home town. Yes, more great sushi-ya in tokyo. But This is really good sushi. And they can speak english and you can pay woith credit card. Sad news is you cannot take a picture in this sushiya. Food was amazing. Staff was very polite and the Chef was great at describing everything. Little intimate place on top of the Palace Hotel. Brings sushi to a whole new level! Chef Minohara the head chef had an amazing personality and compassion fully commitments of what he do . Amazing experience! and shout out to govoyagin’s team for the plug !